At Baselworld this year Hublot is celebrating its long-running partnership with Ferrari with a bold piece that draws inspiration from the “Gran Turismo” universe. The Classic Fusion Ferrari GT features a brand new, innovative design which houses a new UNICO manufacture movement. 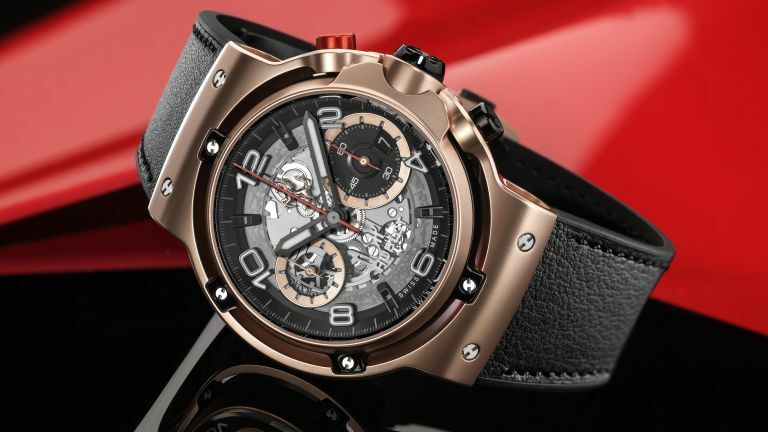 Grand Turismo is all about "driving over long distances at high speed in comfort and with style” and this is the spirit that Hublot has tried to capture in the watch. Hublot and Ferrari have, for the first time, combined their sense of aesthetic creativity and mechanical innovation in a Classic Fusion. You can see that in the beautifully sculpted watch case. In another first, Hublot has integrated its UNICO manufacture movement into a 45mm diameter Classic Fusion case. It measures just 6.75mm thick, but has a long 3-day power reserve. The dial is transparent and features the famous Prancing Horse at 12 o’clock. Every detail has been subjected to meticulous finishing touches, like the red thread around the sapphire crystal, and torx-style chronograph pushers. The straps of the Classic Fusion Ferrari GT have been subtly created in black rubber and dressed with Schedoni leather, like the seats of historic Maranello race cars. The new Classic Fusion Ferrari GT is available in three different cases: Titanium (limited edition of 1,000 pieces), King Gold (limited edition of 500 pieces) and 3D Carbon (limited edition of 500 pieces).